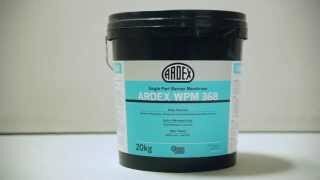 ARDEX WPM 368 is a single component acrylic copolymer membrane that will prevent rising damp, efflorescence and will resist negative hydrostatic pressure when used in accordance with the technical data sheet. It has excellent adhesion to most substrates including brick, masonry, concrete block, concrete, stone and is simple to use by brush, roller or airless spray machine. ARDEX WPM 368 single part damp-proof is safe to use and can be over-coated using almost any decorative paint. ARDEX WPM 368 can be applied to damp surfaces and freshly laid hardened (green) concrete and conforms to the Building Code of Australia as a waterproof membrane. Low water vapour transmission coating and as a barrier/seal coating over freshly laid or damp concrete. Waterproofing barrier on the negative side in below grade surfaces such as basements, tunnels, liftwells, retaining walls and carparks. Waterproofing membrane or barrier coating over freshly laid hardened concrete, prior to the application of conventional levelling compounds carpet and tile adhesives. As a barrier seal coating over damp, green or efllorescence producing concrete prior to overcoating with conventional building paints, ARDEX floor levellers and tile adhesives.